Lake Winnipesaukee is the largest lake in New Hampshire. It is approximately 21 miles (34 km) long (northwest-southeast) and from one to nine miles (1.6 to 15 km) wide (northeast-southwest), covering 69 square miles (180 kmÂ²) (71 square miles when Paugus Bay is included), with a maximum depth of 212 feet (64.6 meters). Sunset on Lake WinnipesaukeeLake Winnipesaukee has been a tourist destination for more than a century, especially for residents escaping the summer heat of Boston and New York City. The Native American name Winnipesaukee means either “smile of the Great Spirit” or “beautiful water in a high place”. At the outlet of the Winnipesaukee River, the Winnipesaukee Indians, a subtribe of the Pennacook, lived and fished at a village called Acquadocton. The site is today called The Weirs, named for the weirs colonists discovered when first exploring the region. Center Harbor witnessed the first intercollegiate sporting event in the United States, as Harvard defeated Yale by two lengths in the first Harvard-Yale Regatta on August 3, 1852. The outcome was repeated 100 years later when the schools celebrated the centennial of the race by again competing on Lake Winnipesaukee. Alton, the largest town in physical area in the lakes region. Gilford, home to Gunstock Mountain Resort, noted for its skiing, hiking, camping and festivals. Laconia, the main commercial city on the lake (surrounding Paugus Bay). Included in Laconia is Weirs Beach, the largest public bathing area on Winnipesaukee. Meredith, whose harbor lies on the northwestern reach of the lake and is famous for its children’s museum. Center Harbor, a small town in Belknap County which serves as the winter home for the MS Mt. Washington. Moultonborough, famous for its Castle in the Clouds, an estate atop a small mountain. Tuftonboro, which contains Melvin Village. 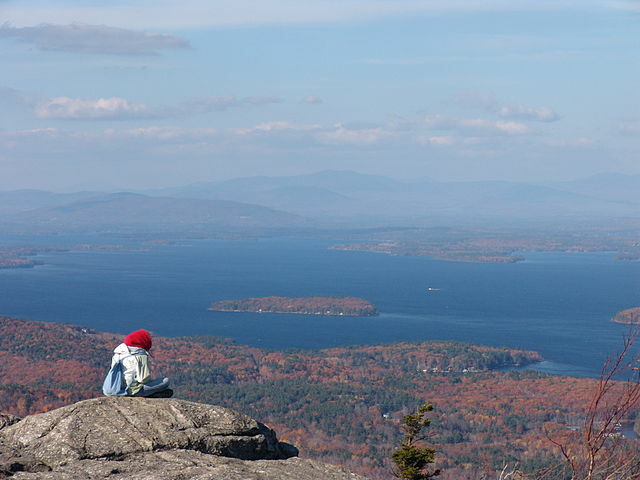 Along with the rest of New Hampshire’s Lakes Region, which also encompasses Lake Winnisquam, Squam Lake and Newfound Lake, Winnipesaukee has been a vacation community for at least a century, particularly drawing people from the Boston region. The area is home to numerous summer theater troupes and offers a variety of land and water recreational activities. 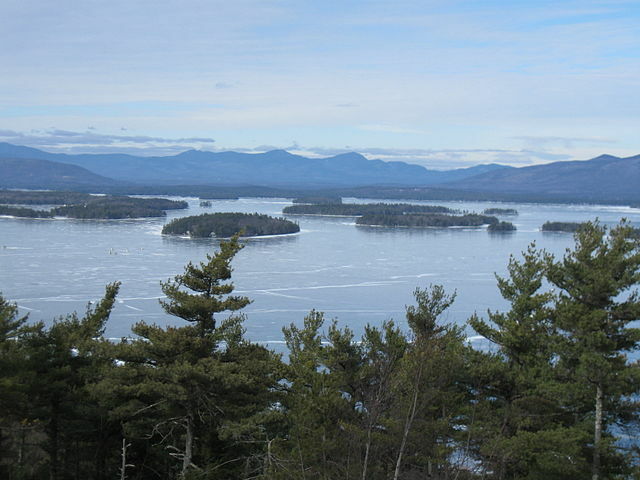 There are numerous hiking trails in and around the surrounding mountains, which include the Ossipee Mountains to the east, the Belknap Range to the west, and Red Hill to the north. The Mount Washington Under Full Speed Ahead, 2006, painted by Peter BuckThe paddlesteamer Mount Washington, named after the highest of New Hampshire’s White Mountains, was launched in spring 1872 to carry mail, goods, and passengers on Lake Winnipesaukee, under the flag of the Boston and Maine Railroad. With a hull length of 178 feet and a beam of 49 feet she appeared as a typical representative of the North American sidewheelers around the second half of the century and was the largest steamer on the lake at that time. The huge paddle wheels were driven by a single-cylinder steam engine of 450 HP at approximately 26 RPM. The power was transferred from the vertical single cylinder to the wheel shaft by the walking beam, high above the upper deck, oscillating in the frequency of the paddle wheels. Known as “The Mount”, her kitchen and restaurant service became famous. On December 23, 1939, a nearby railroad station caught fire from an overheated stove. The fire soon spread to the ship, tied at the dock, and destroyed it. Efforts to cut the Mount loose were to no avail as it was a time of extremely low water and the hull was stuck fast in the mud of the lake bottom. Soon after, a local company was formed to build a new ship. Since Europe was already at war, obtaining steel was impossible. Instead, they purchased an old sidewheel vessel on Lake Champlain: the Chateaugay, a 203-foot, iron-hulled sidewheeler that was being used as a club house for the Burlington yacht club. It was cut into sections and transported to Lake Winnipesaukee on rail cars. A new twin-screw vessel was designed for the hull being welded back together at Lakeport. Powered by two steam engines taken from another ocean-going yacht, the new MS Mount Washington made her maiden voyage on August 15, 1940. Two years after her launch, the new Mount’s engines were removed for use in a navy vessel during World War II. After the war, the Mount Washington returned to the water. The ship was a success in the post-war tourist boom. In 1982, the Mount was cut open and extended with an additional 20-foot hull section to add larger lounge and food service facilities. Still popular, it makes one or two round trips on the lake per day during the summer season, as well as numerous dinner dance cruises in the evenings. Lake Winnipesaukee Weather and Climate: Average summertime on or next to the water brings days around 80 degrees F (26Â°C), with overnight lows around 65Â°F (18Â°C). Less than half a mile away from the water, days can be warmer and nights cooler by several degrees. Summer’s most extreme temperatures away from the water may be as high as 100Â°F (38Â°C) and as low as 50Â°F (10Â°C). A typical winter day brings a maximum of 28Â°F (-2Â°C) with overnight minimum around 15Â°F (-9Â°C). Typical wintertime extremes are 50Â°F (10Â°C) and -20Â°F (-28Â°C) but even greater extremes have been recorded nearby. The water temperature typically reaches the upper 70s F (around 25Â°C) in late July and cools into the 60s (around 18Â°C) in September. Several days of hot, humid weather at the height of summer can bring the water temperature well above 80Â°F (26Â°C.) It normally freezes during the last week of December. Ice thickness during a typical winter can be in excess of 18 inches in many parts of the lake.